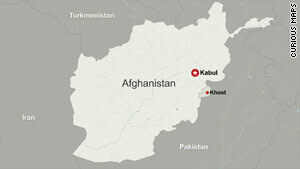 Kabul, Afghanistan (CNN) -- Two of the seven CIA officers killed Wednesday in a suspected terrorist attack on a U.S. base in Afghanistan were contractors for Xe, a private security firm formerly known as Blackwater, a former intelligence official said Thursday. A current intelligence official confirmed to CNN that the casualties included a mix of people -- CIA staff and contractors. The CIA considers contractors to be officers. The Taliban have claimed responsibility for Wednesday's attack, which wounded six other people. A senior U.S. official said information suggested that a bomber walked into a gym facility at Forward Operating Base Chapman -- in Khost Province, near the border of Pakistan -- and detonated bombs in a suicide vest. It is not known how the bomber got past security. In a posting on its Web site Thursday, the Taliban claimed the bomber was an Afghan National Army soldier. A U.S. intelligence official on Thursday vowed that the United States would avenge the attack. "These brave Americans were part of a long line of patriots who have made great sacrifices for their fellow citizens, and for our way of life," President Obama said in a written statement Thursday. CIA Director Leon Panetta said in a statement Thursday that "those who fell ... were far from home and close to the enemy, doing the hard work that must be done to protect our country from terrorism." A U.S. military source noted that Chapman was originally a base for the Khost Provincial Construction Team, but the team left some time ago. A U.S. intelligence official would not discuss the specific mission of the base but acknowledged that it was a crucial CIA post and a "hub of activity." CNN's Barbara Starr, Pam Benson, Atia Abawi and Suzanne Simons and journalist Matiullah Mati contributed to this report.